What is the difference between a metalized film radiant barrier and AtticFoil® Radiant Barrier? Despite being tear-resistant, the film is notoriously difficult to work with because of it’s inability to easily lay flat once rolled out. Does AtticFoil® lose reflectivity over time because of oxidation? The reason is because AtticFoil® is a pure aluminum product. It’s made from 99.5% pure aluminum and a high quality aluminum is NOT AFFECTED by the natural oxidation process of metal. 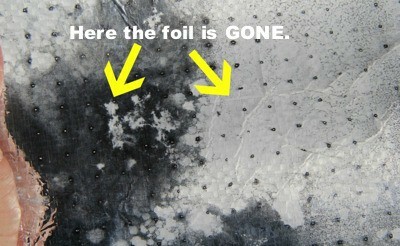 When an aluminum surface goes through oxidation, it produces an organic clear coat/layer/skin over the top of itself. That coat will develop to a thickness that prevents the foil from continuing to oxidize so it will not degrade or deteriorate over time. After the coating of itself, the foil content is still significant enough to continue to operate as a radiant barrier – reflecting heat or blocking heat via emissivity. Metalized aluminum, however, is made up of a very thin layer of aluminum (approximately 1/200th of the thickness used in AtticFoil® Radiant Barrier) deposited onto a polymer film. These products utilize an artificial coating and claim it protects against oxidation; however, many versions of the mylar foil films have shown problems in stopping oxidation when the coating fails and the foil layer practically disappears from the inner scrim! *The worst thing you can do to a metalized film product is perforate it! Once you pierce the surface, you allow air/moisture to get in every 1/2 inch of the surface and because moisture can pass between the layers, it can also get in between the clear coating and the scrim and “consume” the super thin layer of aluminum. You can see for yourself; take a piece of metalized film that is perforated, put it in a zip top baggie with a wet paper towel and wait a few weeks to see the effect. Generally, a solid version of metalized film does not have this issue. BOTTOM LINE: Choose a PURE aluminum, high quality foil radiant barrier (like AtticFoil™ brand Radiant Barrier) and let nature take its course.